Do You Have Trouble Starting An Essay, Getting Stuck, or Too Many Ideas? Many students complain about not being able to start their essays. Some students who start the essay have difficulty writing more because they get stuck. Some experience confusion because there are two many ideas on their mind which are hard to express on paper. Does this describe you? Please see the picture above to help you visualize the outline. This is one example of an outline. Pick a topic and gather some thoughts on it. Pick your position or thesis. The main thing you are arguing or supporting or providing information on in the essay. 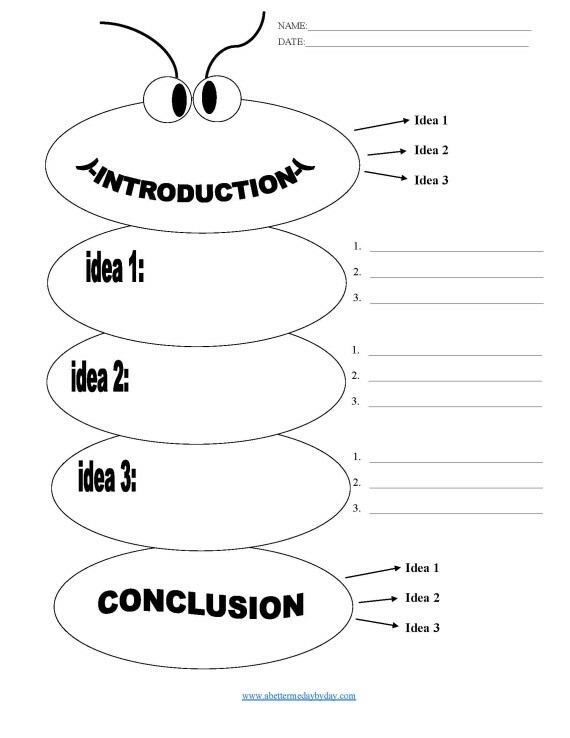 Write these 3 main ideas on your outline. Then come up with 3 mini-ideas that support each one of your main ideas you just listed. Once you complete the blanks you have the meat of your essay ready. Introduction: Write a few sentences that introduces your topic. End it with a thesis statement (your position). Make sure to touch briefly to your 3 main ideas. Body Paragraph One: Introduce your main idea 1 and explain. Use 3 mini-ideas to support your main idea 1. Feel free to use examples. Body Paragraph Two: Introduce your main idea 2 and explain. Use 3 mini-ideas to support your main idea 2. Feel free to use examples. Body Paragraph Three: Introduce your main idea 3 and explain. Use 3 mini-ideas to support your main idea 3. Feel free to use examples. Conclusion: Close your essay by making your point. Restate your thesis. Mention your 3 main ideas and conclude them. Make a closing remark statement to end your essay. Outline helps you organize your thoughts. It helps structurally guide your paper. Using outline helps you move from one idea to another smoothly. Outline helps your writing stay focused instead of ideas being all over the place. When using outline you will not have trouble staring your essay, getting stuck in the middle or having too many ideas. The best part is that it only takes a couple minutes to write an outline. Start writing outlines first before writing your essays. Writing is a process of learning so no one gets it right the first time. It takes time and practice. If you are struggling with writing your essay, wait till you get to high school, college, or graduate school because you will have giant papers to write. It is best to start practicing soon so you can master these skills and get ready! Phoenix Tutoring & Test Prep offers writing tutoring for elementary, high school, college and graduate level. We also tutor APA and MLA styles of writing. Tutors here are supportive and help you improve your writing ability one step at a time. Visit www.phxtutoring.com for more information. You can also Call or Text 773-386-3184.